"Ultimately, this is not so much a political issue as it is a moral issue." Al Gore and a team of documentarians have collaborated here on what is, on some level, the greatest PowerPoint presentation of all time. The jokes about the former Vice President are legion�his manner hopelessly stiff, a slave to consultants or conventional wisdom, claiming too much for his accomplishments as a legislator (cf., the seemingly inexhaustible, never funny punchlines about inventing the Internet), and a hopeless campaigner. It's almost as if the decision against him in Bush v. Gore was liberating, though, for now the public Gore is the fellow we heard about for years but never got to see�a quick wit, a committed public servant, a man for whom family and faith are central but who doesn't feel the need to parade them around like Boy Scout merit badges. Where was this Al Gore in 2000? If he had shown up, the election might not have ended in Katherine Harris's talons. This movie, though, is about a whole lot more than Gore personally�it's his well-crafted, oft-repeated presentation on the dangers of global warming, and what we all need to do about it before things get any worse. One of the most appealing aspects of the movie is Gore's ability to move beyond partisanship, because the scientific case he makes is an incredibly strong one�I don't doubt that the James Inhofes of this world will continue to describe global warming as a tree-hugging canard, but after watching this film, you'd have to be willfully ignorant to maintain that this isn't even worth discussing. In slide after slide and clip after clip, Gore documents how we collectively are producing more and more carbon dioxide, allowing more of the sun's rays to be remain in our atmosphere rather than being refracted back out again. The result is that glaciers are melting, the food chain is being disrupted, temperatures are hotter than ever, and storms bigger than ever. The graphic representation of the melting polar ice caps is the stuff of horror movies, a map of water spreading like relentless inkblots over great swatches of Florida and San Francisco, the Netherlands and Shanghai, and most of southern Manhattan, including the site where the towers of the World Trade Center stood. Gore's presentation is clear without being patronizing, alarming without being hysterical, scientifically challenging without being opaque to a lay audience, and even if you don't agree with his politics, you've got to admire his command of his material and his commitment to his cause�he relates that "I've probably given the slide show a thousand times," and his presentation is polished without ever feeling phoned in. The audience for Gore's presentation is rapt with attention, and he's been outfitted with the biggest screen I've ever seen, one some 45 feet wide. Director Davis Guggenheim intercuts some more intimate moments with Gore�discussing his childhood; the death of his sister, a smoker, to lung cancer; the automobile accident that nearly took the life of his son. Gore has taken some shots for trying to make political hay out of his personal tragedies, but he never seems anything less than genuine�and it's a very strange sight indeed, this man who seemed to have the White House in his grasp, wheeling his luggage through anonymous, identical airports, passing through security screenings, the weary look of a man who just wants to get to his room at the Sheraton and call it a day. It's all a far cry from Air Force One, that's for sure. You've got to give him a world of credit for devoting so much of his time to spreading the word about this unimpeachable science and the very genuine danger it poses to all of us, and even if it's just little things like doing a better job sorting through the recycling or turning off the lights when you leave the room, it's sure to spur you to action. Image Transfer Review: The feature was shot on HD video, so while the contrast is higher than it would be with film, it makes for a fairly reasonable transfer for viewing at home; some of the blacks are blotchy, and there are bits of artifacting now and again. Audio Transfer Review: Either audio option is acceptable; your home theater setup will probably dictate your choice, though with the 5.1 track, you'll get more portentous, ominous scoring out of the back speakers. Extras Review: Director Davis Guggenheim provides an informative commentary track, emphasizing his working relationship with Gore, and how important he felt it was for the audience to connect to the Vice President as a person, not just a talking head. 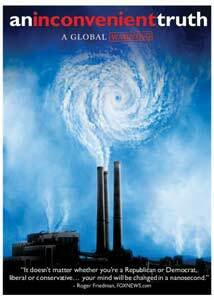 In a chilling bit of synchronicity, the film was to be shot in New Orleans, but only days before the scheduled shoot, Gore's talk about how global warming is responsible for the unprecedented devastation of hurricanes in recent years had to be canceled because of Katrina making landfall. A quartet of the film's producers have the chance to do a little more back and forth on the second track�they're jokey about the movie being one long Apple product placement (Gore's PowerBook is ubiquitous), and about the troubles they had finding the right title for the piece. Lawrence Bender is particularly good describing the reception this film got at the Cannes Film Festival and comparing it to another of his projects that had been very well received there, Pulp Fiction. Gore provides a unique-to-DVD update (32m:23s), shot a year after the feature, a time during which the evidence has become only more convincing and galvanizing. A making-of piece (11m:07s) focuses on the set built for the slide show on a huge soundstage, and the disc also includes a video of I Need to Wake Up, a Melissa Etheridge song that plays over the closing credits. And as you might expect, the DVD comes not in a conventional, wasteful plastic Amaray case, but in an eco-friendly recycled cardboard envelope. I'm not much a conspiracy theorist, but after watching this, you'll probably agree that anybody who calls out Al Gore for being a Cassandra about the perils of global warming is likely on the payroll of a petrochemical company or in 18 different kinds of denial, or both. It's an incredibly sharp and persuasive case for the consequences of some of our choices, and it's an exceptionally important call to action.